Ask SEOs what Google considers to be quality content, and you will get a lot of blank stares. I know because I like to ask this a lot. The number one answer I get, sadly, is that content should be x number of words, where x is usually 200, 300, 500, 700, 1,000, 1,500, or 2,000. More content does not mean better content. A simple query about the age of an actor can be fully answered in a sentence and doesn’t require their life story and filmography. Another answer I receive is that the content should be “relevant.” The problem with this is that low-quality pages can be relevant as well. Other SEOs I’ve asked have given amazingly detailed answers from patents or ideas from machine learning about word2vec, RankBrain, deep learning, count-based methods and predictive methods. Google has quality guidelines here. However, you may notice that there are many guidelines around negative signals but few around positive signals. When reading these, think for a minute what happens when two, ten or a hundred websites aren’t doing anything bad. How do you determine the quality difference if no one does anything wrong? Then there’s this section from Google’s Webmaster Academy course, which tells you how to “create valuable content.” There are a few good tips here on what to avoid: broken links, wrong information, grammar or spelling mistakes, excessive ads and so on. These are useful tips, but again, they focus on what not to do. 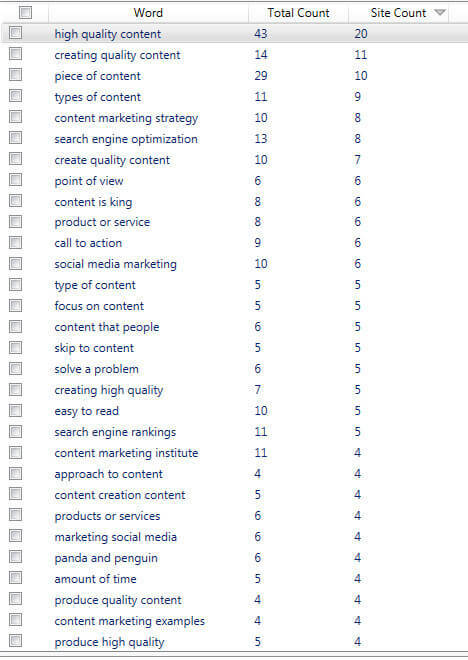 Panda algorithmically assessed website quality. The algorithm targeted many signals of low-quality sites but again didn’t provide much in the way of useful information for positive signals. They expand further on the concept of E-A-T. This was the part of the guidelines I found the most interesting and relevant in determining quality of content (or a website in general). One of the most important criteria in PQ (Page Quality) rating is the quality of the MC, which is determined by how much time, effort, expertise and talent/skill have gone into the creation of the page and also informs the E-A-T of the page. I found the part of about large images amusing. I’m not a fan of hero images unless they are exceptional. Unfortunately, most end up being generic. Some publications make it worse and use generic hero sliders. Remember, there is an algorithm for “above-the-fold,” and I feel like hero images are completely against this. Most hero images provide little to no useful content without having to scroll. MC which consists almost entirely of content copied from another source with little time, effort, expertise, manual curation or added value for users. Sometimes it is impossible to figure out the purpose of the page. Such pages serve no real purpose for users. For example, some pages are deliberately created with gibberish or meaningless (nonsense) text. No matter how they are created, true lack of purpose pages should be rated Lowest quality. I love how these sections are all basically saying that your page needs to have a purpose and be understood. I’ve seen many marketing pages that use so much lingo, jargon or marketing-speak that even people at the company can’t tell you what the page is about. What’s worse is when good content is stripped away to make more of these kinds of pages. There are also some interesting snippets regarding the different elements and signals of trust that might need to be included based on the type of website. This information is extremely important, and it’s easy to brainstorm the different website elements that a local business would need (such as “about us” or “contact”), compared to an e-commerce store that might need reviews, pricing and so forth. The point is that you need to understand the questions your customers are asking and provide that information to them. It can be helpful to think of queries as having one or more of the following intents. The above is very similar to the standard “informational, navigational and transactional” system, but I like this better. Boom! Jackpot. Matching the user intent with the purpose of a page and type of content expected is exactly what I’m looking for in trying to determine quality. This makes sense if you think about it from the standpoint of semantic search. If I’ve got a product page, and the top results for the keyword I’m targeting are all informational in nature, then I obviously need to either create an informational page or add more information to my product page if I even want to compete. I see this mismatch often when people ask why they’re not ranking for a specific term. Even before the Quality Raters Guidelines, way back in 2011, there was this gem on the Google Webmaster Central Blog that told us the questions Google engineers asked themselves when building the algorithm. Does the site have duplicate, overlapping or redundant articles on the same or similar topics with slightly different keyword variations? Does the article provide original content or information, original reporting, original research or original analysis? Is the content mass-produced by or outsourced to a large number of creators or spread across a large network of sites, so that individual pages or sites don’t get as much attention or care? Does this article contain insightful analysis or interesting information that is beyond the obvious? Is this the sort of page you’d want to bookmark, share with a friend or recommend? Are the articles short, unsubstantial or otherwise lacking in helpful specifics? Additionally, there are questions that seek to answer if the person knows the topic well, if the content is unique and how comprehensively the topic is covered. This matches up perfectly with the E-A-T concept from the Search Quality Rating Guidelines. Broken links. Crawl your site with a program like Screaming Frog and fix them. Wrong information. Do research and find the right sources. Grammatical mistakes. You can use a tool like Grammarly or have someone proofread your writing. Spelling mistakes. Use spell-check or an editor. Reading level. The Hemingway App is good for this. You should be adjusting your reading level based on your target audience and the intent of the query. Page load speed. Go read this. Website features. The features you should have will change depending on the type of website and the intent of the query. Matching the user intent with the purpose of a page and type of content expected. Take a look at the search results to see what is already ranking. Authority and comprehensiveness. Keep reading. There are things outside of your control in the short term, but you can play the long game and continue to build your authority over time by consistently creating comprehensive content. At SMX West, I briefly showed a way of identifying all topics/subtopics in an industry and how to completely cover these based on keyword groupings. I believe that if you’re covering everything that’s being searched for and answering every question that people are asking about a topic, then you have a complete answer, and it will be the best answer for a search engine to return in the results. How do I determine quality content? We know that Google looks for concepts and entities in the content, so I usually start here. I use Alchemy API for this. If you run many of the top ranking websites for a search query through Alchemy API, you will find a lot of overlap that indicates useful data. There are likely consistent concepts and entities that you would want to include in the body of your text. Alchemy has a JSON output, and I know a lot of people use Blockspring to pull into Google Sheets. Ultimate Keyword Hunter provides words or phrases that are used on the pages the most. I normally sort by co-occurrence across websites and find that usually two-, three- and four-keyword phrases are the most useful. I set this to pull data from the top 50 search results. Moz’s new Keyword Explorer has an interesting filter, “related to keywords with similar results pages,” that looks at pages that rank highly for the query entered and looks for other searches that contain the same pages. For example, a quick glance shows me that the pages ranking for “quality content” also rank for different terms around blogs, websites, content marketing and content strategy — all of which I may want to include on my page. I like to pull all auto-suggested keywords around a topic with Keyword Sh**ter (terrible name, but it’s very useful) and then put the resulting terms back into the AdWords Keyword Planner, which groups them. These groups are the main ideas I want to cover around a topic, whether all on the same page in subsections or on their own pages. You can see the pivot table I created for auto-suggested terms based on “content quality” here. On a side note, I almost always put the original topic into the Keyword Planner as well, and I will often stem off the original topic into other topics based on the results. Another tool I like is Answer The Public, which I first heard about from Wil Reynolds. Remember to change the country if you’re not from the UK. The tool is scraping auto-suggested terms and displaying them nicely in a grouped fashion by questions people are asking. These create the silo of pages I need around each topic to really make sure I’m covering it in-depth, providing answers to all questions being asked and catching people in every part of their journey. I like to think it makes a website the best answer. The more of these are covered, the more expertise and authority you and your website are building around a topic. It all really starts with the query intent. Then it’s matching your information and your website to the kinds of information that someone would need to be a good result for them. This is the data I use to determine what I need to include in my content for completeness and relevancy. I like to inject my own expertise and opinions into the content as well — after all, it’s important to know what has been said, but it’s more important to add insights into things that might not have been said. I know everyone has their own processes and ways of doing things, and I would love to hear from some of you about how you approach quality content. Let me know what you look for, what tools you use or what your process is for determining quality of content.